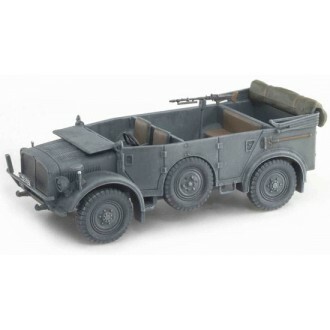 The model beautifully captures the look and stance of the 4x4 heavy car. 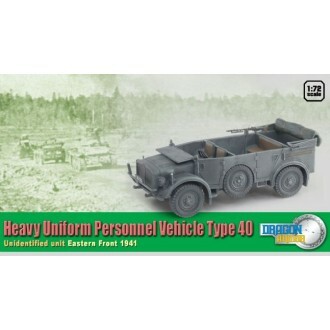 The vehicle is finished in the standard Panzer grey colour of German vehicles from the early-war period, while small details like the "WH" license plate are also present. The Heavy Uniform Personnel carrier was powered by a V8 Horch engine of 3.823-litre capacity. Dragon Armor's 1/72 scale miniature version naturally makes use of 100% new toolings. The open-topped body containing three bench seats (able to accommodate five passengers and the driver) is full of detail. Even the tread pattern on the floor plate is replicated! There is also an MG34 machine gun provided on a pintle mount for antiaircraft duties.